The new Automatic Wood Scrap Batch Feeder is designed for controlled batch feeding of scrap material of different sizes and shapes to an in-feed conveyor for processing by your scrap grinder or pulverizer. Ideal for lumber, woodworking. 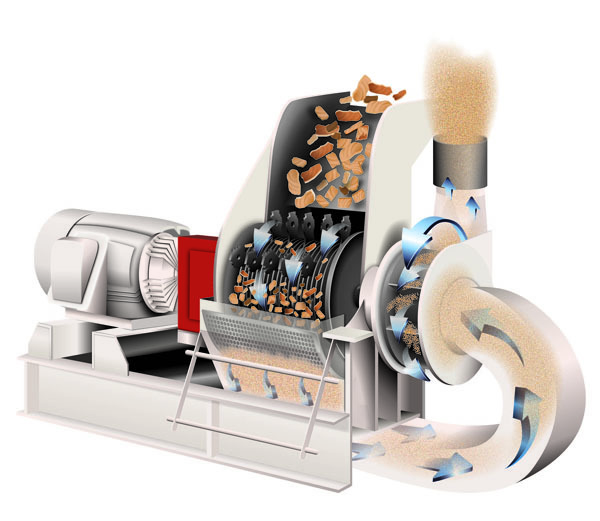 recycling and other operations, the new Batch Feeder receives a load of mixed scrap -such as wood or other bulky materials -and automatically unscrambles, transfers and feeds it to the conveyor. Scrap is loaded into the large throat and feed opening of the unit. The Batch Feeder's innovative design features positive tracking of roller chain-driven drag bars to feed material to the conveyor bed. The drag bars are configured two or three across depending on your capacity requirements. The drag bars are faced with hardened plastic, replaceable wear strips to avoid metal on metal contact between the drag bars and feeder bed and potential sparks. The staggered arrangement of the strips provides for even metering of the load and eliminates material jams and overfeeding. An electronic shear pin overload device automatically stops the feeder and alerts the operator. The variable speed driven Batch Feeder provides an even, steady feed of material to solve problems of surges, thus saving on power costs. Your operator simply loads the machine and leaves it unattended while it sorts and feeds the scrap to the conveyor automatically. You save significant time and labor costs, and your operator is free to perform other more important tasks. Automatic Batch Feeder can easily be added to existing grinders and pulverizers or is available as part of a completely integrated, automatic system from us including feeder and grinder. The Automatic Wood Scrap Batch Feeder offers the innovative features and uncompromising quality in construction and workmanship.